Although there is a dispute as to who discovered the concept of śūnyatā, there is an agreement that the symbol of śūnya was available in India in the fifth century AD. The dot symbol and its subsequent form of the open circle indicate not only nothingness as we know the meaning of śūnya, but it symbolizes infinity as well as there is no beginning or end in the symbol. Therein lies a major symbolic meaning on how the śūnya explains infinite from nothing. Mathematically also the śūnya represents the whole as it cannot be divided by anything. 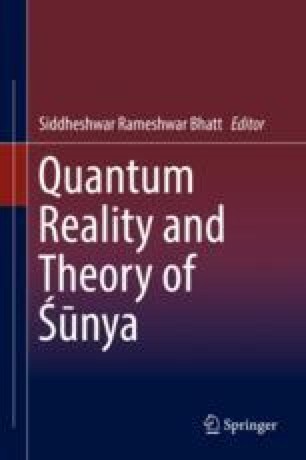 The concept of quantum was basically developed to explain observed reality that was not possible to examine by material science laws that were created in the nineteenth cent ury. It ended up describing the whatness of the reality, without addressing the whyness. It has nevertheless become a major concept in physics today, and its mathematical expressions are being employed to many observations, from origin of the universe to functioning of atoms. However, it is worth noting that the quantum concept is a system developed by admitting the failure to comprehend and making that as the basis to attempt explaining all the physical phenomena. It has obviously succeeded in explaining and predictive verification of many processes to a certain extent. However, it has also become limited when applied more broadly. In other words, it has failed to develop a unified principle for even all things physical. The basic narrative of physical science, or even science for that matter, is observational, although theoretical concepts (both philosophical and mathematical) do play some role. In the observational world, sensory reality is perceived first. Sharma DR. Zero infinity and God. 2003. Sulekha.com (http://dharambir-rai-sharma.sulekha.com/blog/post/2003/03/zero-infinity-and-god.htm), March 2, 2003.